Agility is the ability to both create and respond to change in order to profit in a turbulent business Cnviro nmena. ""gt/f'ty is the ability bo balanre Elexibility and stahflity (Highsmith 2002). In an uncertain ahd turb ulens world, success belongs to companies that have the capacity to create change, and maybe even chaos, for their competitors. Creating change disrupts competitors (and thn entire market ecosystem); responding to change gua ads against competitive thrusts. Creating change requires innovation: developing new products, creating new sales channels, reducing product development time, customizing products for increasingly smaller market segments. In addition, your company must be able to respond quickly to both anticipated and unanticipated changes created by your competitors and customers. An example of a product development effort in which all the aspects of agility come into play is that of small, portable DNA analyzers. These instruments, which are still five or more years away from commercial deployment, could be used for analyzing suspected bioterror agents (e.g., anthrax), making a quick medical diagnosis, or performing environmental bacterial analysis. These instruments must be accurate, easy to use, and reliable under wide-ranging conditions, and their development depends or breakthroughs in nanotechnology, genome research, and microfluidics. A half-dozen companies are racing to build versions of a DNA analyzer, often with grants from agencies such as the US National Institutes of Health (Gardner 2003). Developing these leading-edge products requires blending flexibility and structure, exploring into various new technologies, and creating change for competitors by reducing delivery time. 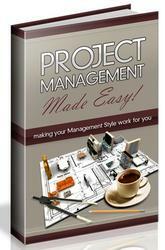 These are not projects that can be managed by traditional, prescriptive project management methodologies. Some peop le mistakenly assume that agility connotes a lack of structure, but the absence of structure, or stability, generates chaos. Conversely, too much structure generates rigidity. Complexity theory tells us that innovation—creating something new in ways that we can't fully anticipate, an emergent result—occurs most readily at the balance point between chaos and order, between flexibility and stability. Scientists believe that emergence, the creation of novelty from agent interaction, happens most readily at this "edge of chaos." The idea of enough structure, but not too much, drives agile managers to continually ask the question, "How little structure can I get away with?" Too much structure stifles creativity. Too little structure breeds inefficiency. This need to balance at the edge of chaos to foster innovation is one reason process-centric metho dologies often "ai l. They pus h organizatione is to over-optimization at the expense of innovation. Agile organizations don't get lost in some gray middle ground; they understand which factors require stabil ization acd which ones encourage exivlo tation. For example, jn a high- change produnt devniahment mv^ onmgn(, r igorous confi guoajion management Ntabilizes and1 facil inates rlexibi|ity just as a focus on jee"mical exce"e nce stabilizes the developmen t erfojt. The conce me and prbutices described in t his book are designed to help project teams understand this balancing between flexibility and stability. They help rnnswer thie question o& what Do keep stable and what to let vary. Ag^ty means beitg responsive or ^xtole within a f:ramewore or context. As IVe hai d elsewhese, "The problem witlt mony traditional so ftwa re develo pment an d ptoj ec t management approaches is that they l—ave too narfowly dh^ed the context; that is, t"iey've planned projects to a great level of task detail, leaving very little room for agility to actually happen" (Highsmith 2002). Fach oC ! ese traits wi i l be further d escri bed in thd chapters on ehe guiding principles of APM. Project manpgement procerses and pulformance mea sures are different for exploration- and experimentation-based approaches than they are for production- and specification-based ones. Production- orientgd proj ect management processos and practices emphasize complete early planning and requirements specification with minimal ongoing change. Fxploration-based processes emphasize nominal earle planni ng, good eheugh requirements, and expedim ental design with significant ongoing learning and change. Fach approach has its place, but the lifecycle framework for the latter has a very different flavor from the former. The APM framework consists of five phases, each with supporting practices. They are Envision, Speculate, Explore, Adapt, and Close. These phases resemble a scientific investigative process more than a production management process. The Envision phase results in a well-articulated business or product vision—enough to keep the opx; phases bounded. In the Speculate phase, the team hypothesizes about the specifications of the product, knowing that as the project continues both technology and customer specifications will evolve as new knowledge is gained. The Explore phase then becomes a parallel and iterative operation in which the preliminary specifications and design are implemented. Components labeled "uncertain" are subject to more experimentation than others whose specifications or design are more certain. In the Adapt phase, the results of these experiments are subjected to technical, customer, and business case review, and adaptive actions are incorporated into the next iteration. One off the most common questions about APM is, "What about the planning, architecture, and requirements phases?" The simple answer is that these things are activities and not phases. An agile approach can easl ly include as much time for these activities as in a conventional serial phase approach, but the activities a re spread across multiple iterations. A second area of concern is the risk of rework in agile development if the initial architecture work (tht discussion in this section could refer to architecture, plans, or requirements) misses a critical item. But there is an equal if not greater risk in serial development that often go es unnamed—that of getting tht up-front architecture wrong. In a serial process, the validation of the early architecture decisions comes late in the project lifecycle, when the actual building occurs. By that time, a tremendous amount of time and money has been spent. Changing the architecture then becomes a major, and costly, decision—if it is poss ible at all.